NEW YORK (AFP, REUTERS) - US Secretary of State Mike Pompeo and high-ranking North Korean official Kim Yong Chol will try to settle nuclear disagreements and set up a historic summit between their leaders, holding a second day of meetings on Thursday (May 31) in New York. US President Donald Trump said he was expecting the delegation from Pyongyang to travel to Washington on Friday to deliver a letter to him from leader Kim Jong Un. Trump said he was hopeful his unprecedented summit with Kim, who exchanged violent rhetoric with the US president before they began talking of a summit, would take place on June 12 as originally scheduled but left open the possibility talks would fall through. Disputes between Washington and Pyongyang led Trump to announce last Thursday he was cancelling the meeting with Kim due to take place in Singapore, only to say the following day that it could still go ahead. The days since have seen a flurry of diplomatic efforts to get the summit back on track. If the North Korean delegation goes to the White House, it would be the first visit there by high-level Pyongyang officials since 2000 when Jo Myong Rok, a marshal, met President Bill Clinton. Pompeo and Kim Yong Chol, a close aide of Kim Jong Un and vice chairman of the ruling Workers’ Party’s Central Committee, left a 90-minute private dinner at a New York apartment on Wednesday night without providing details about their conversation. 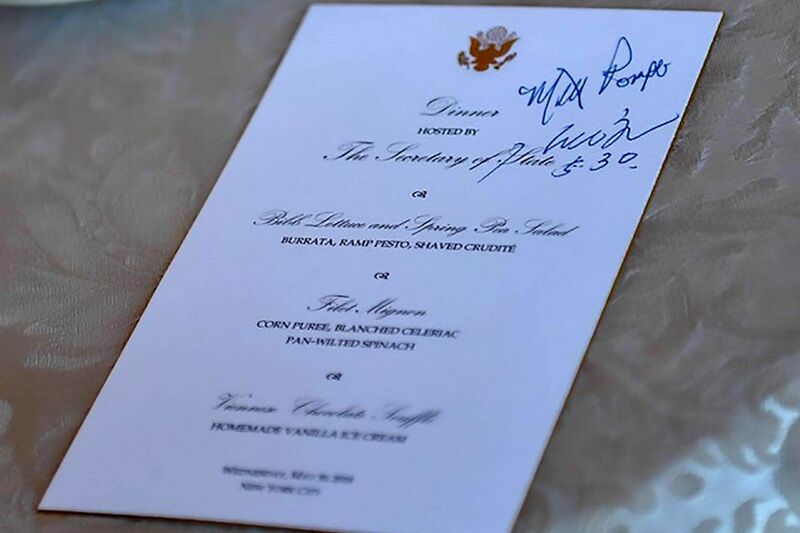 Pompeo would only say that the dinner "was great" and that the two men dined on "American beef." Another round of talks was scheduled for Thursday, with Pompeo expected to leave New York that afternoon. The United States has been demanding North Korea abandon its nuclear weapons program amid reports that it is close to being able to launch a nuclear-tipped missile capable of reaching the United States. “The potential summit .... presents DPRK with a great opportunity to achieve security and economic prosperity,” Pompeo said on Twitter on Thursday, referring to North Korea by the initials of its official name, the Democratic People’s Republic of Korea. “The people of North Korea can have a brighter future and the world can be more peaceful,” he said. In Pyongyang, Kim Jong Un welcomed visiting Russian Foreign Minister Sergey Lavrov in the first meeting between a Russian official and Kim as head of state. Lavrov invited Kim to Russia and called for a phased approach to denuclearisation, including easing of international sanctions on North Korea. Russia has appeared to be on the fringes of a flurry of diplomacy but Lavrov’s visit was a move to raise its profile in international efforts to ease tension on the Korean peninsula, said Artyom Lukin, a professor at Far Eastern Federal University in Vladivostok. A senior US State Department official briefed reporters separately as Pompeo and Kim Yong Chol met late on Wednesday. The official, who asked not to be identified, said North Korea is “going to have to make clear what they are willing to do” in response to Washington’s demands. North and South Korea have technically been at war for decades, even though the Korean War’s military combat ended in 1953, because a peace agreement was never signed. “At the same time as working to achieve the goal of denuclearisation, we should also build long-term and effective initiatives to keep peace on the Korean peninsula,” Chinese Foreign Ministry spokesman Hua Chunying said in Beijing.